Golden Needle Black Tea is one of most precious black tea in the olden days. This special black tea is made from pine needle shape tea leaves, hence the name Jin Zhen which simply means Golden Needle. Golden Needle Black Tea is a good quality black tea that has been exported to overseas for many years. Some enjoy this tea together with milk for afternoon tea break. 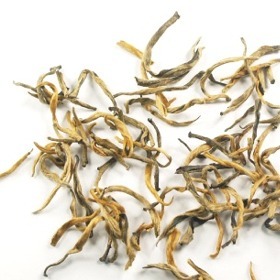 Smooth and mellow tea with a hint of subtle peppery taste and sweet fragrance. Young tea leaves with downy tea buds. Tea leaves are needle-like shapes. Classic Golden Needle. Tastes like a complex mix of honey and maple syrup and pleasing tannins. A nice light black tea that Ive chosen to devote a Yixing pot to. A very nice tea with a bit of a honey after-taste. Interesting aroma. An excellent wakeup morning tea. Ill order again. This is a great te. I was looking for a replacement for a tea I used to get from another vendor that they discontinued and this is a match plus smoother. I Order 2 pounds with one as a gift and they loved this tea as much as I do. This is one of the best teas I have had and cant get enough of it. I like to mix it with a citrus herbal tea and it takes the flavor to another level. This tea is a must have. As always this tea is out standing.